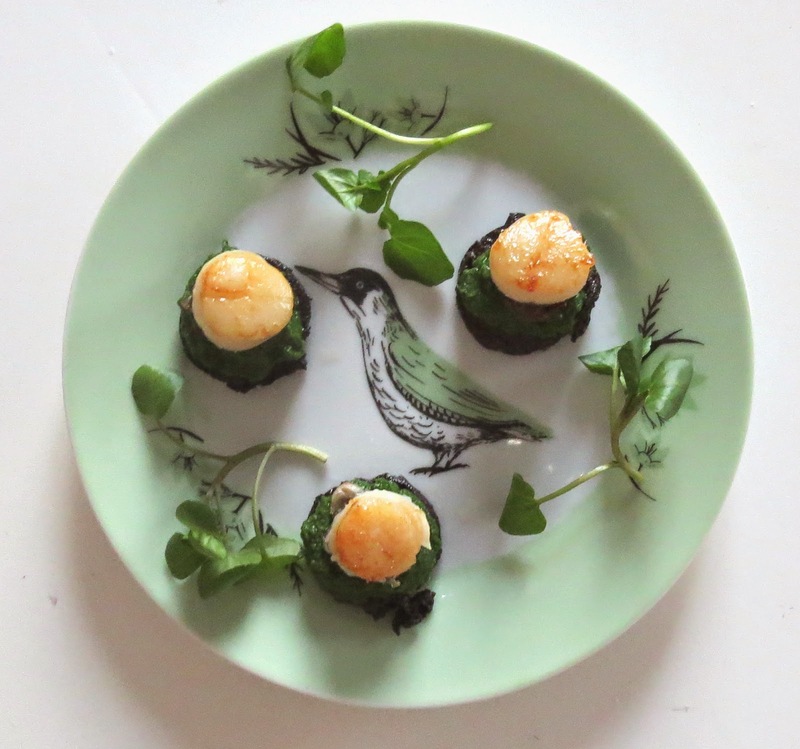 I'm continuing to try to develop recipes that focus on using gorgeous British seasonal produce, and a couple of weeks ago, I whipped up this scallop recipe as a starter at home. Scallops are in season at the moment and should be in plentiful supply at your local fishmonger. It's completely up to you whether you leave the roe (the orange meat which is, in fact, the creature's reproductive organs) intact or not. I like to eat scallop roe, some don't, but for presentation purposes the roe is removed in this recipe (otherwise the scallop doesn't "stack" very well with the other ingredients). Kale is also in season in October, but many avoid it as a "boring" food that can't be used as much more than a steamed side dish. Adding to garden peas (frozen is fine) with a dollop of honey makes a delicious purée. Heat some coconut oil in a non stick pan, and use a small sharp knife to make tiny knicks around the edge of each slice of black pudding, this stops it from curling up as it cooks. Fry the black pudding slices on both sides until cooked. Add the scallops to the same pan and fry on each side, very briefly, until just cooked. Remember, you can eat scallops raw, there's no risk of "under cooking" but over cooked scallops will be rubbery and unpleasant. Using a high powered blender (I use my NutriBullet) combine the kale, peas, honey and a little seasoning to make your purée. Arrange three pieces of black pudding on each plate, and top with a dollop of purée before topping with a single scallop. You may wish to stab a cocktail stick through the entire stack but it should be fine to eat with a fork. If you have a go at this recipe I'd love to see your finished dish - tag me in photos on Instagram and Twitter (@ashlawrencerye) . To browse other ingredients that are in season in October here in the UK, check my list, here.